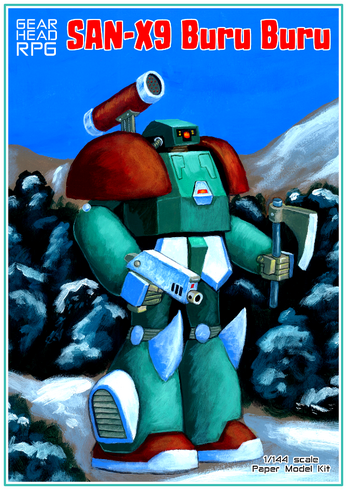 The BuruBuru is one of the most common mecha in the GearHead universe. The original design dates all the way back to the Age of Superpowers, though it has been updated through the years to keep up with new technology. 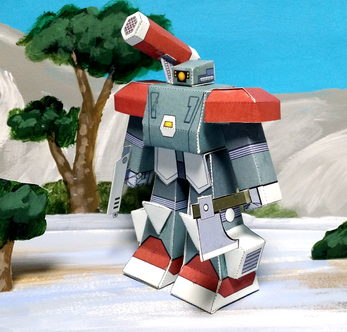 This mecha's two big advantages are its ease of modification and rugged durability. Other designs may be faster or more powerful, but few have the staying power of the BuruBuru. This model is painted in the colors of the Terran Defense Force. Included in the package you'll find an info sheet, the mecha parts, and a set of optional decals which you can use to customize your ride. I recommend printing the parts on heavy cardstock (180g or thicker) and the decals on label paper. When printed on A4 or US Letter paper, this model will be at 1/144 scale (or roughly n-gauge, if you want to add it to your model railroad); actual size is about 12cm tall. You can print it at 50% to make a miniature more suitable for gaming, or blow it up to A3 size so it's the same scale as a Perfect Grade plastic mecha kit.